Looking for documents to be checked or perhaps a Parish Register entry you have found, a lookup service is available £10 per hour (minimum of 30 mins) plus copies of any documents at cost. The lookup service is also available for photographing of documents, headstones and places of interest which relate to your ancestors. Any photography fees/licences charged by organisations are passed on at cost. Rates for hourly work are a competitive £20 per hour, I would usually recommend an initial purchase of 5 hours work, but if you require as little as an hour that can be accommodated too. Any Birth, Marriage and Death Certificates or copies of other documents are charged at cost. No charge is made for travel to local archives within 50 miles of my home location. contact me to purchase the perfect gift for that special occasion. This starter package is aimed at research in the late 19th and the 20th century, it will include, where available copies of census records and appropriate certificates. 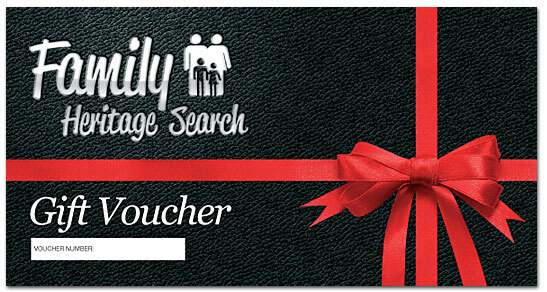 This package can be utilised to trace back at least 2 generations or to find more on a particular ancestor of choice. This package includes tracing back one of your ancestral lines for up to 4 generations from the agreed starting point. This package includes research, analysis and production of a full report on your ancestors. This package includes tracing back of two or more of your ancestral lines from the agreed starting point, this will cover several generations. This package includes research, analysis and production of a full report on your ancestors. If you seek a variation of the packages above, then please contact me and we can discuss modifying one to your requirements. Payments can be made by Bank Transfer, Cheque or PayPal, contact me for details. For the Elm or Oak Packages I can arrange for a printed family tree to be professionally produced, these are priced from £40 dependent on size and number of lines to be included. Contact me for further details. Many people want to research their family history themselves, but they don’t know how to start or are confused by the information out there, or they have started, but have found that they have hit a “brick wall”. If this is you, then contact me and I will see what I can do to help. For those yet to start I will advise you on what you need to do, with one to one sessions if that would help (dependent on location). For those who have come to a stop, I can look at what you have found to date, suggest sources that could be searched, and their whereabouts in the UK. Charges are at the same rate per hour as for ancestry research.